Comments: Exterior view taken from Old Church Hill. Comments: Postcard view of the exterior taken around 1910. The church of St. Mary and All Saints stands in Old Church Hill, Langdon Hills. 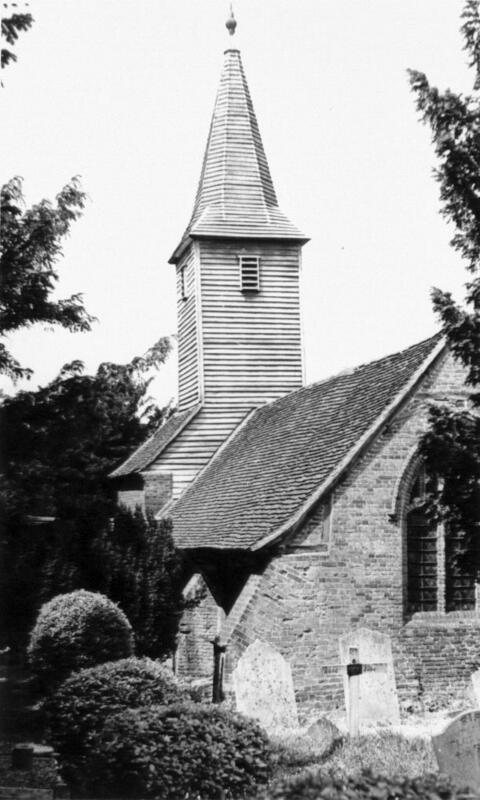 Although located in Langdon Hills the church falls within the boundary of the Borough of Thurrock (formerly Thurrock Urban District 1936-1974; Orsett Rural District 1894-1936). St. Mary and All Saints, c.1930. Photo appears courtesy of the Essex Churches Website. A church is believed to have occupied this site from at least the 14th century though the present building probably dates from the 19th century. It is known that a restoration or substantial rebuild was carried out in 1841, and from this it could be taken as a possible indicator to the age of the present structure. Despite the restoration, its location put it at a disadvantage to best serve the growing local community and in 1877 a new St. Mary's and All Saints church was built at the summit of Crown Hill and this effectively rendered the church semi redundant to all but burial services. The new church was the work of the then Rector Easby Digby Cleaver who is said to have financed its building from his own funds. With infrequent use the condition of St. Mary soon began to cause concern and another restoration was carried out in the 1930s but by the 1960s the church had once again falling into a ruinous condition and was declared redundant from 19th October 1971. It is not known exactly when the last service, for whatever reason that may have been, took place. The condition of the church continued to deteriorate as a result of general neglect and a growing vandalism problem prompting the Church Commissioners to submit a Scheme by Order in Council whereby the church could be converted to a private residence*. This was confirmed on 19th January 1973 and the church was soon sold and duly converted by 1975 to a private residence, which it remains today. In August 1981 the building was designated a Grade II listed building. The change of use to residential does not affect the churchyard which has unrestricted access to the public. A new portion of churchyard was consecrated on Sunday 10th June, 1928 by the Bishop of Barking, James Theodore Inskip. In 1964 a short article on St. Mary and All Saints by renowned local historian Jessie K. Payne appeared in a local newspaper*. At the bottom of a steep hill stands the tiny church of St. Mary and All Saints'. Outside the east window, sunk deep in the timber, is a crossbow bolt, a reminder that it was not always peaceful here, and on the left of the path to the porch is Robert Benton's gravestone; he died in 1712. Inside the church that has not been used for 87 years the past leaps to life. Facing the door is a row of iron hat pegs where men in Victorian days hung their hats before going to sit in the box pews which still stand in the north transept. One pew is said to have been for the landlord of the Crown Inn. Here also is the parish bier in which the coffins of poor people in the village were wheeled to the churchyard for burial. The three-deckers pulpit is an unusual survival, the preacher occupied the top, the reader of the scripture the middle and the clerk the bottom. At the west end of the church is a musicians' gallery where the villagers made their own music with flutes, oboes and other instruments. There are two bells; one was brought here in 1458 from the old church of West Lee 26 years after the parishes were united. West Lee church stood near Westley Hall Farm. Over the rood beam where the figures of Our Lord, St. Mary and St. John stood before the Reformation is a framing filled with plaster on which is painted the Royal Arms of Charles II put up at the Restoration. There are only two other "Restoration" Arms in existence. On the underside of the beam is a groove where the rood screen was fixed which originally divided the chancel from the nave. The first recorded rector was Gregory in 1200. The church belonged to Beeleigh Abbey near Maldon and in 1212 Henry Abbot of Beeleigh, was rector. After the new church on the hilltop was built in 1876 the old church was used for burial services only and, subsequently, became in such bad repair that it was closed as being unsafe. In 1931 it was restored, but once more funds are needed for its repair. In 1931, the then Rector, Cecil Edleston Livesey, wrote an account detailing the history of the church and parish, and that of the former parish of West Lee, which can be read here. A list of Church Rectors from 1366 to 1930 can be found here. (1) * Source: London Gazette, issue No. 45888, page 1032, published 23/01/1973. (2) * Source: Basildon Standard, published January 1964. (3) St. Mary and All Saints church received listed status on 28th August 1981. Text researched and written by William Cox, 2004 with revisions 2017. Copyright © 2004, 2017, B. Cox - Basildon History Online. All rights reserved.